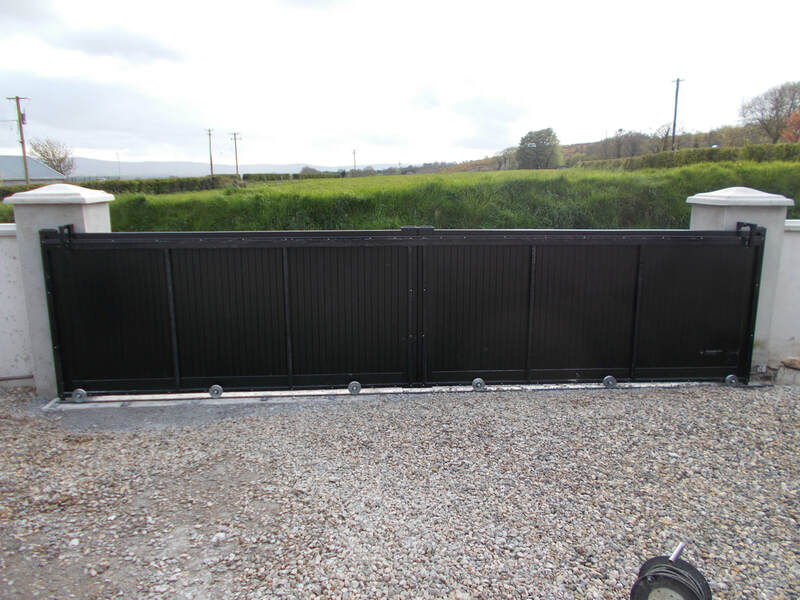 At Walsh PVC Gates & Fencing we carry a wide range of both Driveway and Pedestrian Gates. 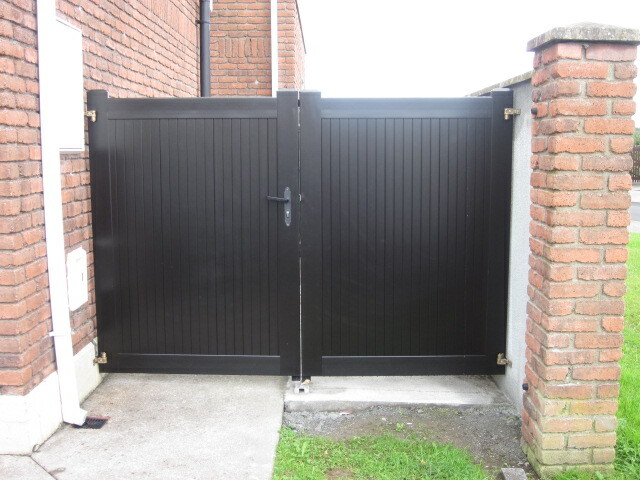 Our PVC Gates are supplied in White, golden Oak and black which have a wood grain effect. 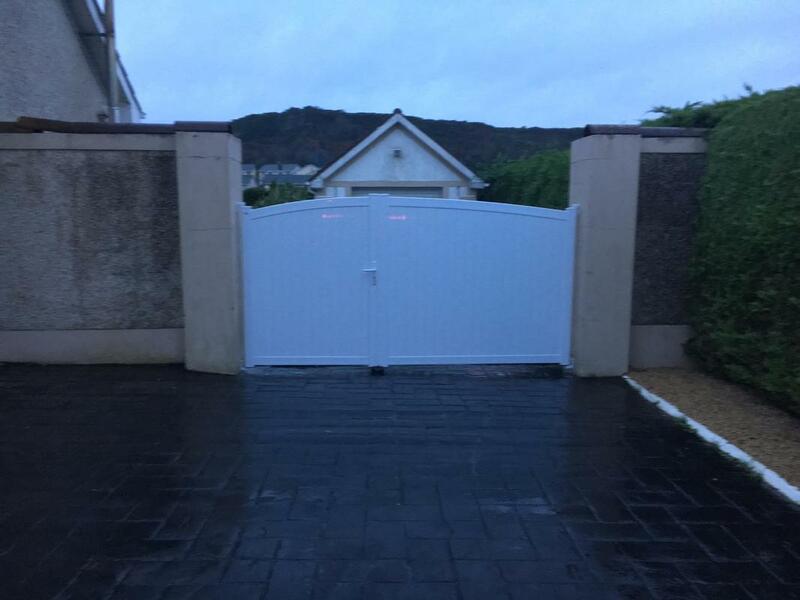 PVC Gates are made to measure to suit individual requirements and we are happy to advise Clients on opening options such as whether a gate can be manufactured as a ½ + ½ or as a 2/3 + 1/3 option. 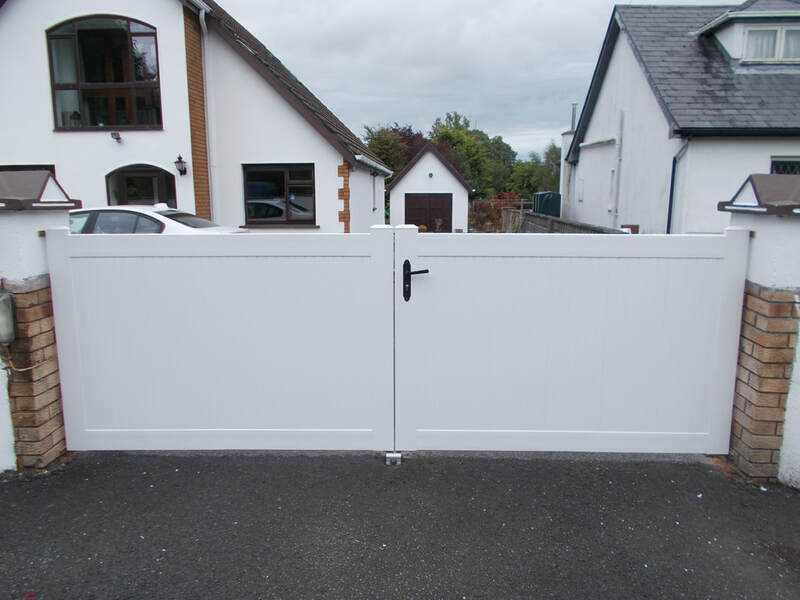 PVC gates are low in maintenance and are supplied with high standard fittings such as hinges, locks and shooting bolts. In cases of high gates we also attach as normal a ‘storm bar’ which when not in use can be easily folded and attached to the rear frame of the gate. You no longer have to worry about painting, varnishing or protecting your gates or fences ever again - all you need to do from time to time is give them a wipe down with a damp cloth. Ranch Style gate for 12ft opening. Large Picket Gate and Fence combination. Arched Gate in Golden Oak. Golden Oak Panels at 45 deg angle. Golden Oak Garnish Style Gate on cut-stone wall. Golden Oak PVC cladding on a Metal Frame, ready for automation. NEW TO THE MARKET. Garnish Driveway Gate in Black woodgrain. Low Garnish Style Gate with Blach Surround. 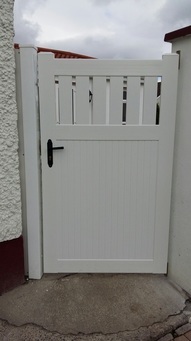 High Drombeg Style Gate in Beige. with PVC Piers. 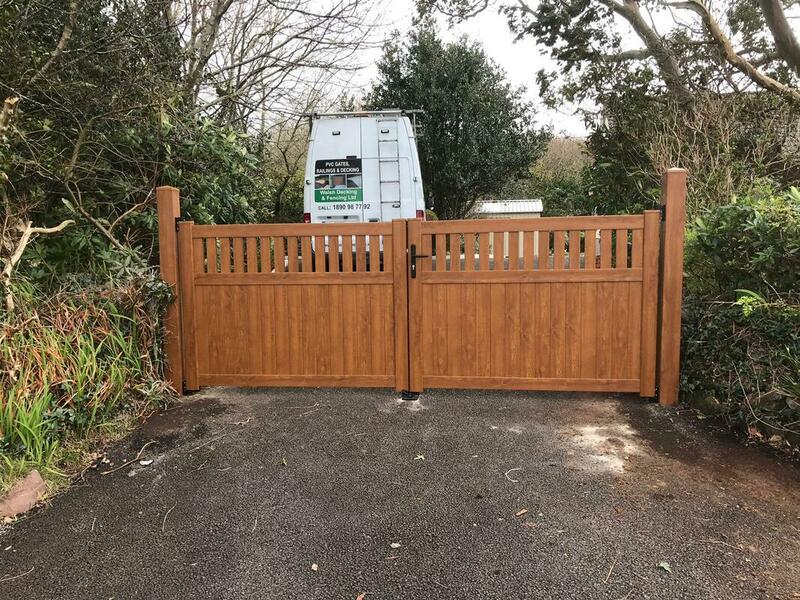 12ft wide gate with pedestrian access. 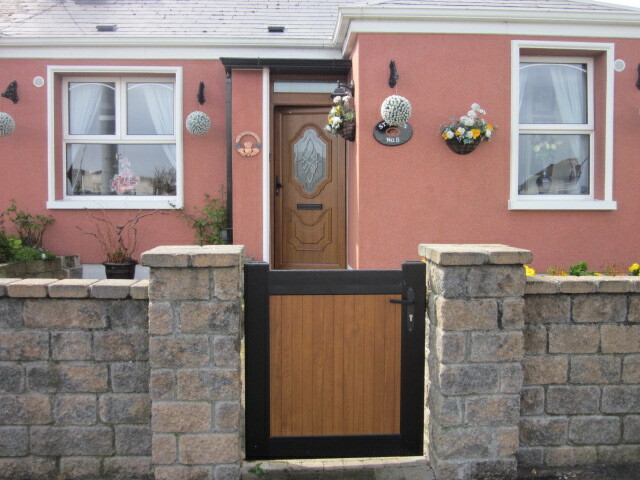 Extra Wide Drombeg Side Gate with low pickets. Small Side Gate with 2 static fence panels. 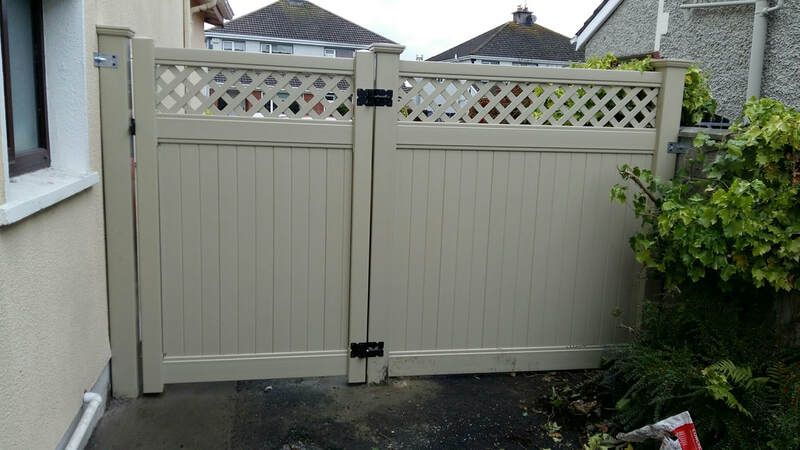 Side Gate & Driveway Drombeh Style Gates in Beige - Colour matching Fence panels. Carberry Golden Oak. Opening outwards. 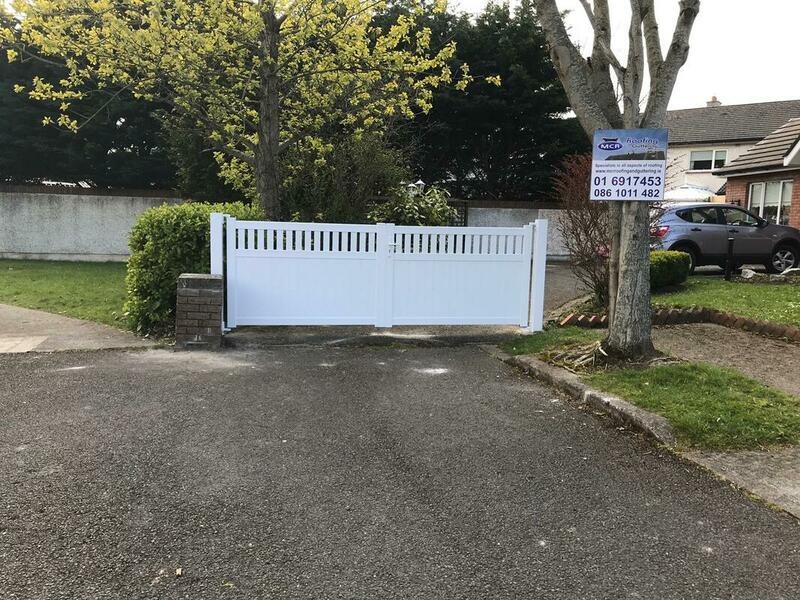 4ft wide side gate with matching fence panel. 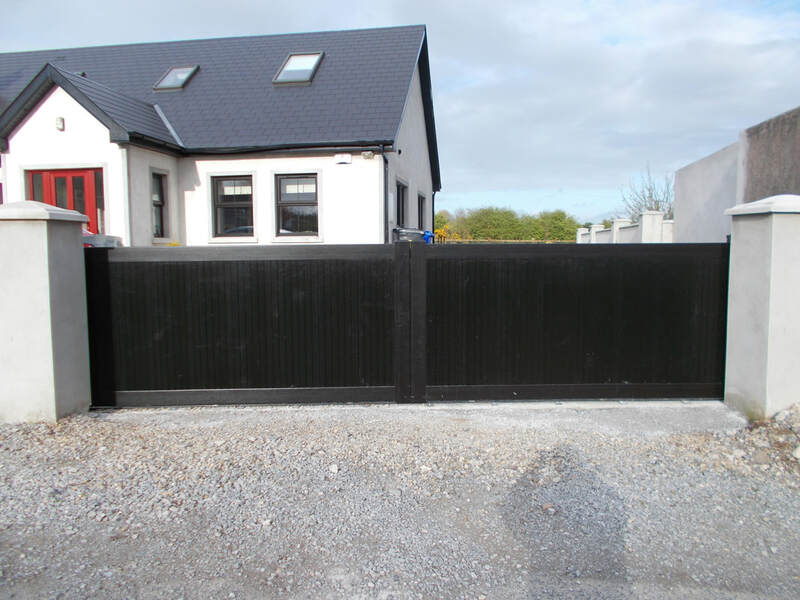 Rear View of 4ft wide side gate with matching fence panel. Kenmare Style Gate with a pedestrian opening. Rear View of Garnish Style Gate showing the Storm-Bar in the engaged position. When not in the engaged position it folds neatly onto the gate frame. Rear View of Sliding Gate. NEW PRODUCT: Aluminium Sliding Gate. Available in a range of Colours. Golden Oak Side Gate matching the PVC Golden Oak Fence Panels. 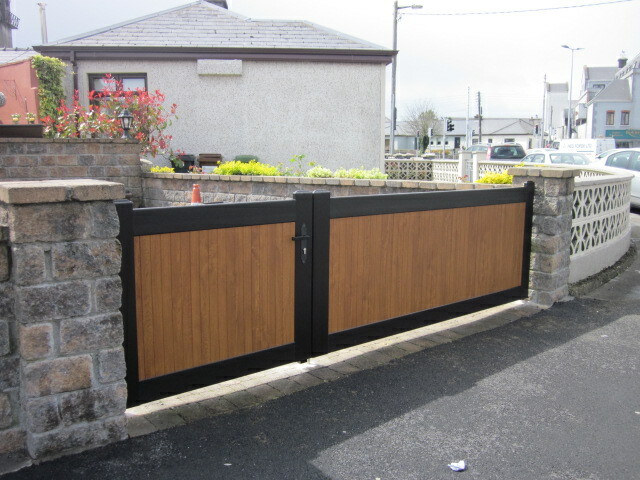 Drombeg Style Golden Oak Gate with PVC Piers. Golden Oak Side Gate with Matching Fixed Panel.